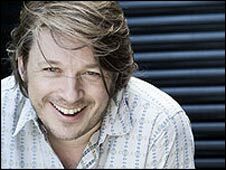 Stand-up Richard Herring has hit out at the decision to give the "Spirit of the Fringe" to every comedian in Edinburgh. Herring, who has been appearing at the Edinburgh Fringe for 17 years, said it was his first Edinburgh award but it was a "patronising cop-out". David O'Doherty won the main prize at the If.comedy awards and Sarah Millican was named as best newcomer. The £4,000 Spirit of the Fringe prize money was spent on booze for an end of festival party for the comedians. Awards producer Nica Burns said she was sorry Herring did not join the 200 comics at the Spiegeltent on Monday night who consumed £4,000 of booze in a mere two hours. She added: "The panel decided that in a year when the spirit of the comedy fringe was a hotly debated topic that there was no one show that embodied that spirit. "It is their extraordinary camaraderie, their talent and their enormous contribution to the Fringe which the panel has recognised and celebrated." She added that while she "totally" disagreed with Herring, she was delighted he was continuing the tradition of debating the awards. Writing on his blog, Herring wondered whether every comedian could now put If.comedy winner on their posters. He said: "Far from looking like a magnanimous celebration of the comics, it actually looked like the panel were saying - 'To be honest, no-one epitomised the spirit of the Fringe this year, so we're just going to give it to you all'. "In a year where there were fewer shows nominated than usual, which already gave out the signal that the panel thought there were only seven shows in the whole Fringe good enough to be on the list, it only felt like a bit of a kick in the teeth that they couldn't think of anyone to give the prize to." Herring said he challenged Ms Burns about the decision. She gave him £20 to represent his share of the award. The awards producer said: "A man who can be made happy by a mere £20 is pretty special. All the other men in my life have cost me a great deal more!" The comedian went on to say that the awards had lost their power since they stopped being called the Perriers two years ago. He added: "Now most of us seem to enjoy the chance to have a party at the end, paid by some men from the city, where we can get drunk and socialise with our fellow comedians and toast the end of another year."